Let's try to prevent a future problem. It's cheaper and less stressful than dealing with the problem if it arrives. If you have a problem in need of a solution, we can help with that too. Many require services relating to cybersecurity, physical security, cybercrime, and fraud. 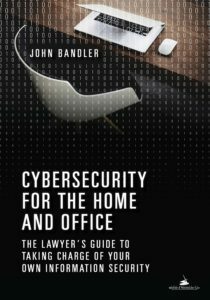 Contact me directly at info@cybersecurityhomeandoffice.com, or visit my law firm's site at bandlerlaw.com or my consulting site at bandlergroup.com. Whether you are an individual, family, small business, medium business, or large corporation or financial institution, I can help. Cybersecurity should start in the home. Many people would be surprised at how much home and work are intertwined, and how security of one affects the other. Knowledge is transferable as well. Home is where you can learn to take control of your own security and privacy, and then you can apply your learning to work. The manager or senior executive who understands cybersecurity in the home will be positioned to better understand how to properly protect their company. That's the main premise of the book. Cybersecurity must extend to the office as well. Every business has a responsibility to take reasonable measures to secure their data and systems. Professionals such as lawyers, doctors, accountants have special responsibilities, and anyone running a business should take steps to evaluate and improve their security. Cybersecurity regulations and legal duties are here and expanding. If regulations are what cause you to act, don't let compliance be your ultimate goal, be mindful of the underlying purpose and spirit of the regulation. Experienced and objective professionals can investigate properly to figure out what happened, get things working again, deal with the aftermath, and work to prevent it from happening again. Of course, an ounce of prevention is always preferable. Develop a strong program, system, processes, and team. Invest in yourself, your company, and sound policies and procedures. Depending on what is appropriate for the client and project, these services can be provided as legal services or consulting services. Feel free to contact me at info@cybersecurityhomeandoffice.com or visit my company websites.